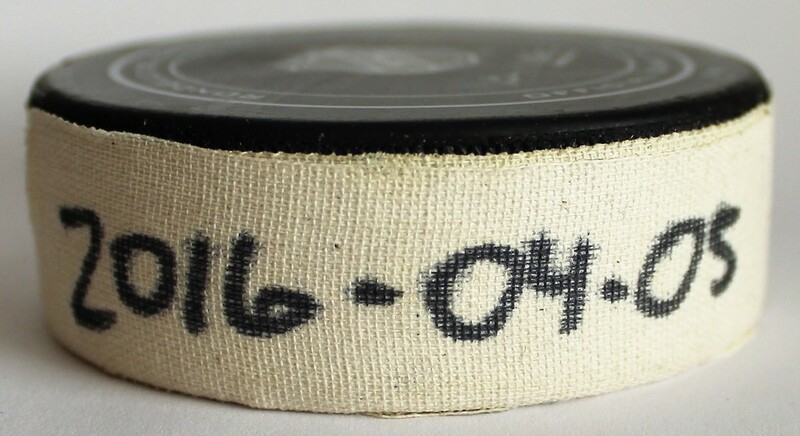 SCORED BY SIDNEY CROSBY on april 5, 2016 at ottawa. the goal was crosby's 35th of the 2015-16 season and 337th of his career. Sidney Crosby scored 36 goals and assisted on 49 others for 85 points in being named to the NHL All-Star First Team in 2015-16. After scoring just six goals and 13 assists in his first 28 games, Crosby welcomed new Head Coach Mike Sullivan who was hired on December 12, 2015 to replace Mike Johnston. Over the next 52 games, he racked up 30 goals and 36 assists for 66 points, an average of 1.27 points-per-game. Crosby continued his elite play in the Stanley Cup Playoffs recording 19 points (6G, 13A) in 24 games while capturing the Conn Smythe Trophy as the Most Valuable Player of the tournament and leading the Penguins to their fourth Stanley Cup in franchise history. On April 5, 2016, the Penguins faced the Ottawa Senators at Canadian Tire Centre in Ottawa. With the Penguins holding on to a 4-3 lead late in the game, Jean-Pierre Pageau gave the puck away to Chris Kunitz on the left wing half wall. Kunitz deftly played the puck to Kris Letang who took the puck at the top of the faceoff circle and skated the puck out of the Penguins' defensive zone. Just before he reached the red line, Letang fired a cross-ice pass to Crosby on the left side of the ice. Crosby gathered the puck and rifled an aerial shot from just outside the blueline into the back of the vacant Ottawa net with 6.3 seconds left in the game. The goal sealed the victory for the Penguins who won the game 5-3. 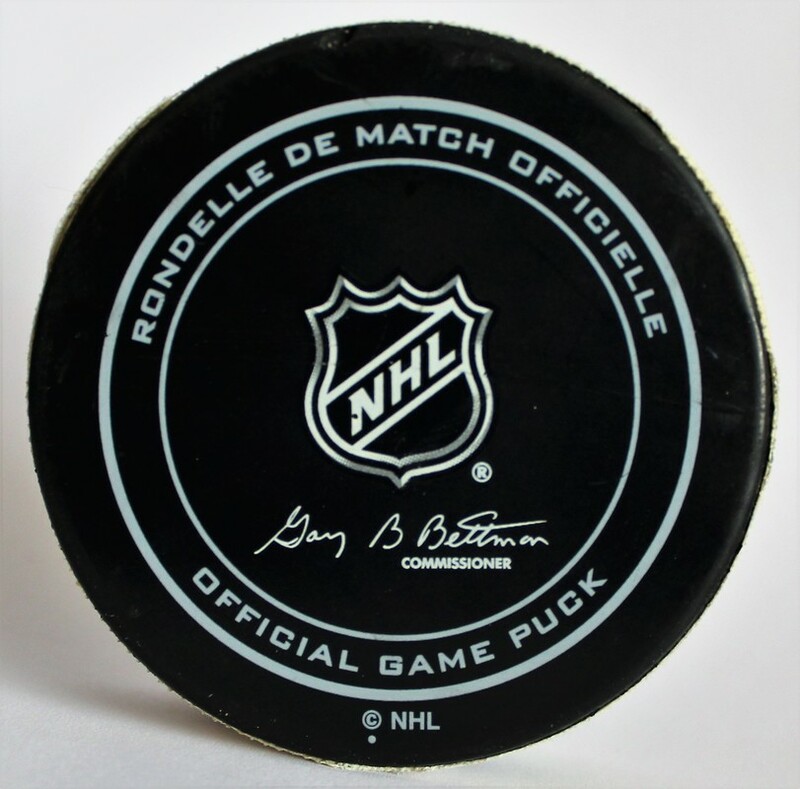 This puck was scored by Sidney Crosby at 19:53 of the third period of the April 5, 2016 game as the Pittsburgh Penguins faced the Ottawa Senators at Canadian Tire Centre. 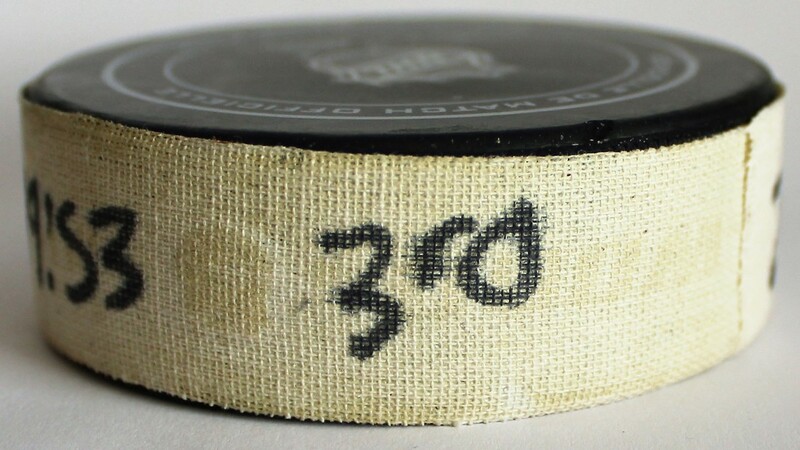 The goal was Crosby's 35th of the 2015-16 season and 337th of his career. The even-strength goal was scored into an empty net and was assisted by Kris Letang and Chris Kunitz. The Penguins won the game 5-3. 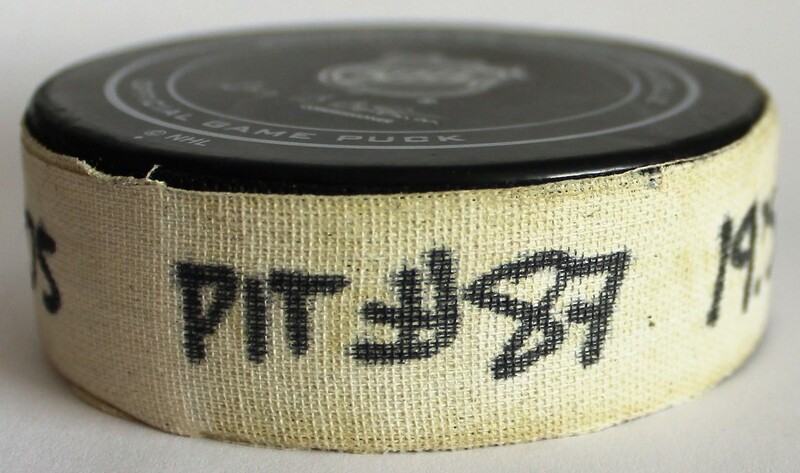 The puck was acquired by PenguinsChronicles.com ​​from the Ottawa Senators on March 13, 2017. 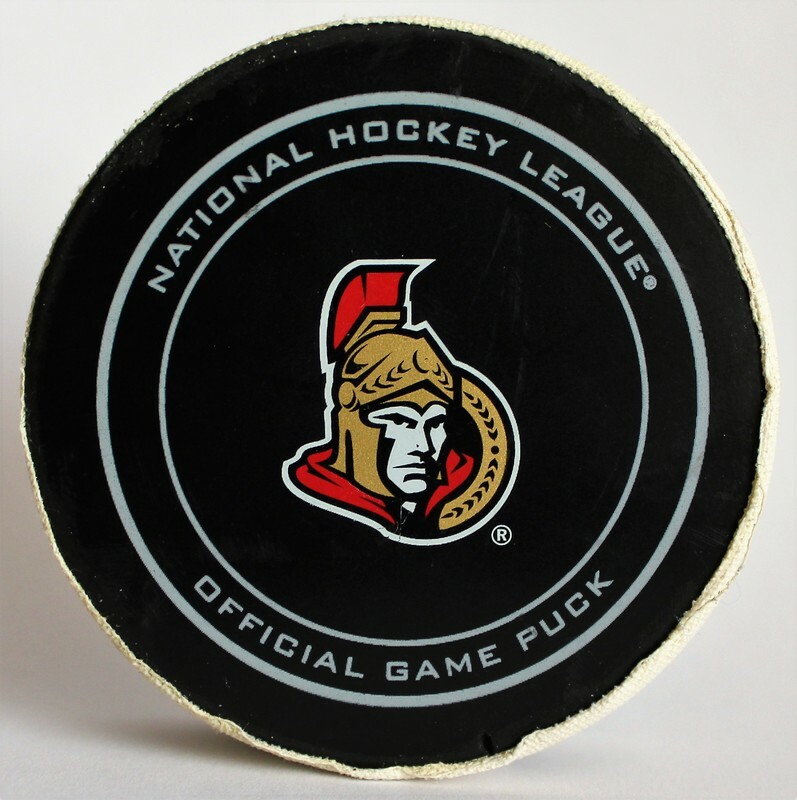 The puck was part of the Ottawa Senators Game Used Puck Program and was purchased from The Sens Store. 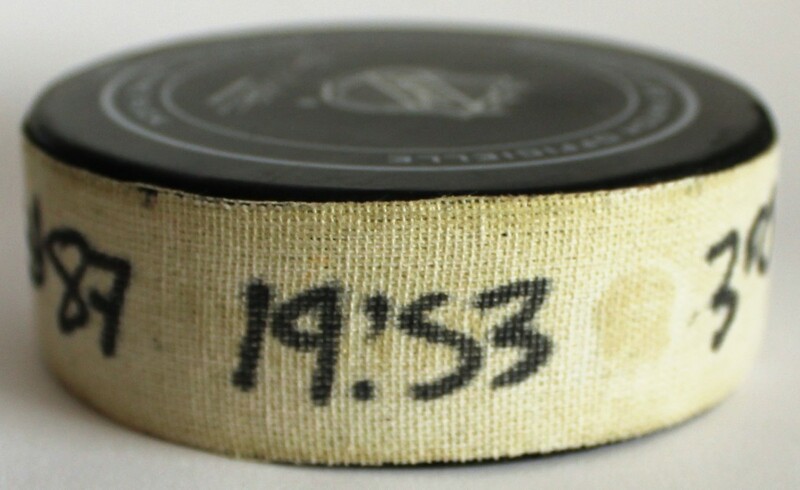 An Ottawa Senators / The Sens Store certificate of authenticity was included with the puck along with an affixed AUTHENTIC hologram with #2436154. 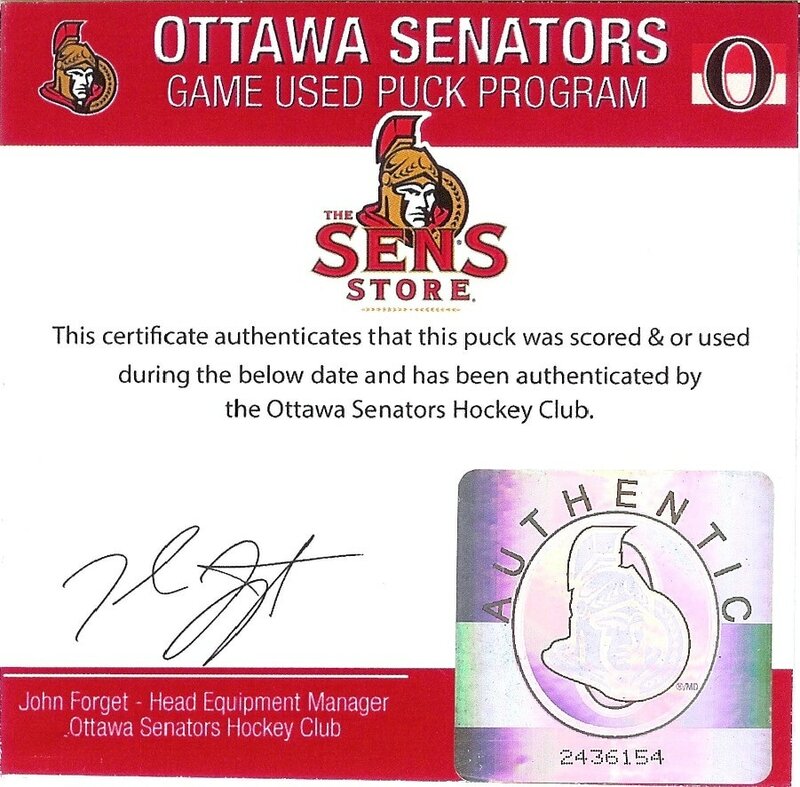 The facsimile signature of John Forget, Head Equipment Manager Ottawa Senators Hockey Club, is also on the certificate.